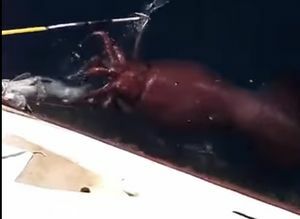 Russian sailors recently came across a massive squid, which they captured on video posted to YouTube. The bright red creature was apparently trying to eat a fish the men had snared, but the sailors pushed it off its prey before it jetted back down into the depths. The largest-known specimen of the elusive colossal squid weighed nearly 1,100 pounds, and they're a bit shorter than their giant squid cousins. The first living colossal squid wasn't captured until 2007, and scientists were able to dissect the second intact animal in New Zealand last year.